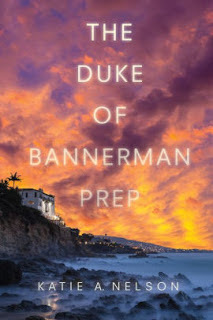 I'm Katie A. Nelson, author of The Duke of Bannerman Prep. I'm hanging out on the couch with Wookie. 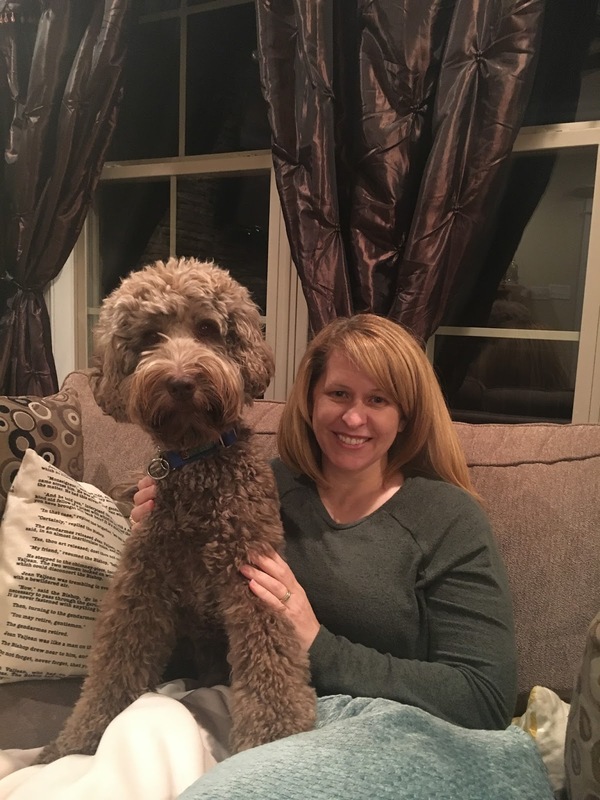 He's a male labradoodle, a little over two years old. Since I work from home, Wookie and I hang out together most days. He loves to follow me from room to room, and helps me stay on task. I don't actually drink coffee, but it's gotten cold here lately, so I usually make a hot chocolate mid morning. Otherwise diet Pepsi is my go to when I need a pick me up. Any treats for you or Wookie on this occasion? How were you and Wookie united? We got Wookie as a puppy. We hadn't planned on getting a dog yet, and had just been looking around to see what was out there. When we found out he was available, we drove over to meet him and fell in love! It wasn't great timing, as my husband and I left for Europe a week later, but luckily Wookie's aunt was willing to take care of him while we were gone. We love Star Wars, and it seemed to fit him. Much like Chewbacca, Wookie likes to act tough, but sometimes runs away in the face of danger. Or, you know, a really mean Canadian Goose. 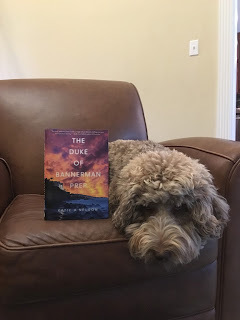 Does Wookie do more to help or hinder your writing? Wookie is a great help most days. He keeps me company while I'm at my computer, and is always up for a walk when I get stuck and need to work something out. He also keeps me from eating too many snacks while I write. Has Wookie inspired the creation of any fictional dogs? Actually, there is a dog in the book I'm working on right now that is inspired by Wookie. Wookie thinks he's the hero of the story and needs a larger role. We're working that out in revisions. Squirrel! We have a large tree in our front yard and Wookie corners all kinds of squirrels there. Where is Wookie's favorite outdoor destination? Walks around the lake in our neighborhood. Who is Wookie's best pet-pal? His best friend was a golden lab named Ranger who lived next door to us in California. Sadly, we moved a few months ago and he misses his friend! What is Wookie's best quality? He's very intuitive and always knows when someone is sad or lonely. Wookie will rest his head in your lap or come over and lay on your feet to offer comfort. If Wookie could change one thing about Californians, what would it be? He's not a fan of rap music and gets agitated when someone in the car next to us is blasting it. Wookie likes alternative rock, and singing along to Disney show tunes. If Wookie could answer only one question in English, what would you ask him? What's so scary about the vacuum? If Hollywood made a movie about your life in which Wookie could speak, who should voice him? What advice would Wookie give if asked? Quit wasting time on the internet and get back to work! 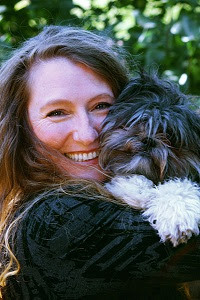 Visit Katie A. Nelson's website. 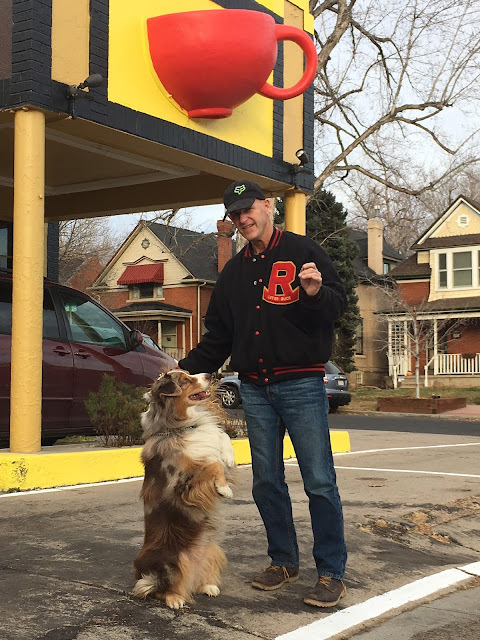 I’m Gavin Ehringer, a journalist and author, and he’s Onda, my 8-year-old Aussie shepherd...and truly my best friend. We’re inseparable. Black coffee for me, water served in stainless steel for Onda. We keep it simple. Any treats for you or Onda on this occasion? I like carrot cake, and always keep cheese-flavored Charlie Bear treats in my pocket for Onda. How were you and Onda united? He was bred by Las Rocosa Australian Shepherds - the Hartnagle family were foundation breeders of Aussies, and I’ve been a family friend for 30 years. All eight of my dogs have come from their farm. Onda means “wave” in Spanish. I first saw Aussies at the beach in California as a kid. I called them “surfer dogs,” because I didn’t know their breed! Later, I encountered them in Colorado. This one’s actually Onda No. 2. 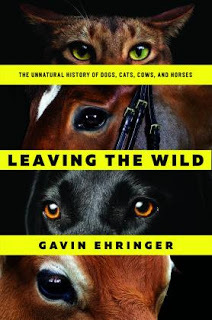 Leaving The Wild, The Unnatural History of Dogs, Cats, Cows and Horses considers how these animals became domesticated, and what they got and gave up in return. 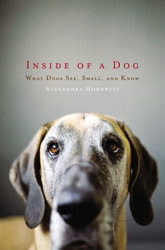 It’s really an examination of how animal breeding influences animals’ lives, for good and bad. Yes! Onda rides a Dogtown-brand Slateboard, as well as competes in Frisbee, agility, dog shows and herding. I worked at teaching him to ride off-and-on for nearly two years before he mastered it. Is it true that Onda is not shy about performing in public? Yes, he’s not. He often does agility and “trick” demos for charity, and we do tricks in front of coffee shops and outdoor restaurants to amuse people...He’s like a street busker, and can draw a crowd. Who is Onda's best pet-pal? Well, we have a new puppy named Whammo! (with an exclamation mark). They’re pretty close, despite the age difference. What is Onda's best quality? Gosh, he has so many! He’s just laid back and happy, and always eager to learn new things. Where is Onda's favorite outdoor destination? He likes going to the farm where he was born, to herd sheep. He also likes the beach, as one would expect of a surfer dog. If Onda could change one thing about Coloradans, what would it be? Well, the Aussie actually should be the official state dog, in his opinion. The state played a big role in the breed’s development, and I think he’d be grateful for some recognition of that. Aussies aren’t really from Australia. If Onda could answer only one question in English, what would you ask him? If Hollywood made a movie about your life in which Onda could speak, who should voice him? Matt Damon. Like Matt, Onda is smart, talented and has a great sense of humor. And he’s ruggedly handsome. What advice would Onda give if asked? I’d probably ask him for advice. He’s the brains in this partnership. 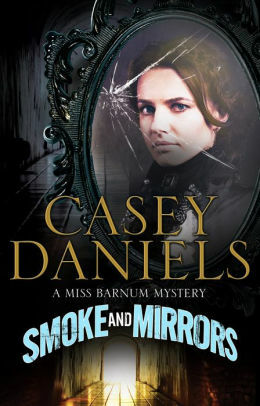 I’m Casey Daniels, mystery author. My latest book is Smoke and Mirrors, the first in the Miss Barnum mystery series that follows the adventures of a (fictional) sister of PT Barnum as she works at his American Museum and solves mysteries along the way! My “date” for tea is Lucy. Breed? Your guess is as good as mine! Even the vet isn’t willing to try and figure that out. She’s very tall and very furry and though she sometimes acts like a herder (she likes to nip the legs of the other dog in the house), she also can howl like a hound. We suspect maybe some Irish Wolfhound is in there somewhere. It would explain the long legs. But the furriness and the herding instincts ... who knows! We celebrate Lucy’s birthday on December 15 and in 2017, she’ll be 2. We’re home enjoying our afternoon cuppa. We have tea together every morning (Tetley British Blend), then we treat ourselves to a cup of Typhoo (a nice strong English tea) every afternoon. Nope. We’re pretty careful about treats mostly because our other dog (a 12-year-old Airedale named Ernie) is on a restricted diet and can’t have much of anything. Lucy gets a couple treats now and then when Ernie isn’t looking! Lucy is a prison dog who I found online at a site called Terriers in Need. She was dropped at a shelter when she was about four months old and she lived there for a bit, then was part of a prison training program. 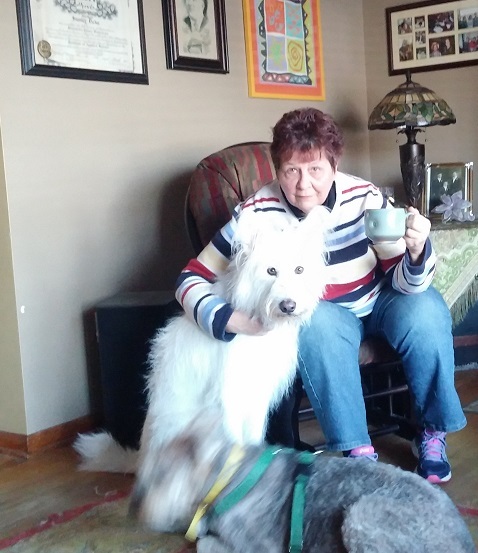 Lucy lived with an inmate in a prison for about six months as part of a terrific program where along with compassion and responsibility, the inmate learns a skill (dog training) and the dog is taught basic commands. She was well trained when she came to us. Well, except for “come” which she thought was the funniest word on the planet and an invitation to run in the other direction and dare us to chase her. Happy to report she’s got that command down pat now! 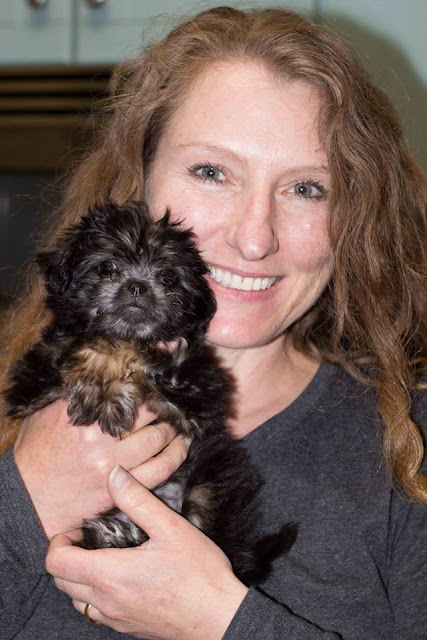 Naming the dog sparked a family debate. Lucy was the one name we could agree on. As far as aliases, there are plenty: Loosey Goosey, Lulu, and the ever-popular Lucy-Fur (say it fast) for those times when she forgets her manners. 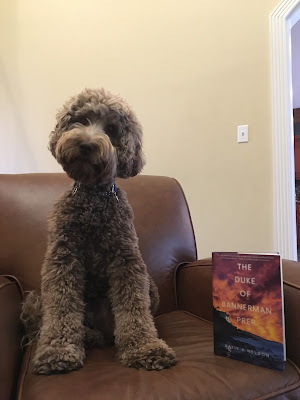 Does Lucy do more to help or hinder your writing? Since I write all day and she snoozes all day, I’d say she’s a help. Has Lucy inspired the creation of any dogs in your fiction? Not yet, but she will one of these days especially since I am currently working on a contemporary mystery that features a woman who trains Human Remains Detection dogs. I’ve been on a training with HR dogs and it was fascinating. Lucy would love it! Me? Not sure I have the stamina! She loves to watch everyone and everything outside--squirrels, the chickens next door, cars, trucks, falling leaves. All are a source of fascination. I often wonder if this is because she didn’t see much of the outside when she was in prison. Mr. Bunny and Mr. Squirrel (durable canvas stuffed toys), a Kong, a squeaky bone. Nothing too fragile, she’s a big dog with a powerful bite. Who is Lucy's best pet-pal? She’d love, love, love Ernie the Airedale to be her best pal, but alas, Ernie would rather sleep than play. Still, recently when he was sick, she refused to leave his side, and she constantly offers him her toys. He’s an old guy, and very laid back, but Lucy is persistent. Sometimes too persistent! One of these days, she’ll learn you don’t mess with an Airedale. When I first talked to the people at the prison about her, they said she was a “sweet” dog. Hmmm ... I wondered what that meant. I’ve had a few dogs over the years, and I’ve loved them all to pieces, but “sweet?” Then we met Lucy and I knew exactly what they meant. She really is a dear. She loves to be hugged, she likes to be petted. In spite of her size (and she’s a moose, far bigger than the Airedale), she is gentle and so quiet, she can slip in and out of a room without anyone noticing. This comes in handy especially when she’s stealing folding money or socks, two of her favorite things to walk off with. See above, I bet she’d love it if I had the energy and the time to do something like HR work, or search and rescue, or agility. There’s a lot of energy packed into that furry body and she’d love to expend it with more running and chasing and jumping. Me, not so much. If Lucy could answer only one question in English, what would you ask her? I’d ask where she came from and how she ended up in the shelter. If Hollywood made a movie about your life in which Lucy could speak, who should voice her? Ha! It may be because she played Matron Mama Morton in the movie Chicago, and a lot of that movie takes place in a prison, but I always think Lucy’s voice would come from Queen Latifah. What advice would Lucy give if asked? She’d tell you to roll with the punches. She’d tell you that sometimes--like when you’re dumped at a shelter in the middle of the night and then you go to prison--things don’t look too good. But if you hang in, if you hang on, you can end up finding people to love who love you right back! Monkey is a four-year-old Brussels Griffon mix. She’s a perfect angel, no matter what anyone says. (No, she did not bite that jogger.) 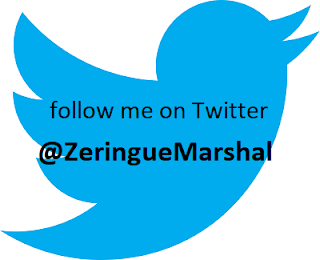 I'm Jennifer Kincheloe, a public health research scientist turned writer of historical mysteries. 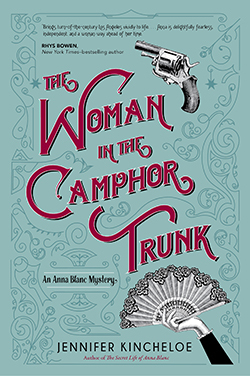 My new Anna Blanc novel is The Woman in the Camphor Trunk. I buy green Ethiopian Yirgacheffe beans and roast them myself in a popcorn popper, grind, and brew them. These beans would blow your mind. Any treats for you or Monkey on this occasion? How were you and Monkey united? It started in the 90s when my husband and I were first married. We were thinking about getting a dog. Our breed book had a picture of this creature who looked like Oscar the Grouch, but not much like a dog. It was kind of a running joke for us. We laughed about it for years. The breed was Brussels Griffon, and pretty rare in the west. I’d never actually seen one. Fast forward to 2013. I saw Monkey on the Adopt a Pet website and wanted to make my husband laugh. So I woke up early so I could be at Petco at 6:00AM to wait in line for the adoption event. I sat on the dirty side walk for five hours with thirty or so hopeful dog-parents-to-be. When the event began, I nabbed her. My husband laughed and laughed, and we’ve been blissfully happy ever since. Does Monkey do more to help or hinder your writing? She’s good for historical research. Brussels Griffons were the “It Dogs” in the first century of the 1900s. Also, she keeps my blood pressure down. Who is Monkey's best pet-pal? Monkey doesn’t care for the company of other pets. She likes to scare my daughter’s dog, Buffy, who is a golden retriever. What is Monkey's best quality? If Monkey could change one thing about you, what would it be? She’d want me to rub her tummy all the time instead of just half the time. If Hollywood made a movie about your life in which Monkey could speak, who should voice her? My daughter Samara would have to do it. She’s always talking in this funny “Monkey voice” attributing selfish attitudes and snotty dialogue to the dog. My daughter’s Monkey imitation is as funny as anything on the planet. What advice would Monkey give if asked? “Never get another dog.” She likes being the only one. The Page 69 Test: The Woman in the Camphor Trunk.